Ladies, Top 10 Reasons why Walking is Good for You!! One of the flagship programs of the Whole Woman Network is ‘Healthy Steps: A Community Walking Club’. We all know the benefits of exercising regularly and we are also aware of the challenges women face with respect to the required resources: creating the time, having the available funds for gym memberships, developing the willpower and most importantly maintaining the consistency of an exercise routine. And so, when we decided to choose an activity to help our members develop and/or maintain good health, we wanted something that would neutralize their previous challenges and also be fun and engaging. WALKING was the clear choice. It is an activity that 99% of the population engages in, consciously or not. It a natural part of daily living and so we just sought to formalize the process and create a certain degree of awareness about it. This led to the birth of our community walking club. So if you are still sitting on the fence about joining our walking club or starting one in your neighbourhood, here are the top 10 reasons to have a rethink! 5. It improves your mood and decreases the risk of depression; walking also reduces your overall cholesterol and at the same time increases High Density Lipo-protein (HDL), also called ‘Good cholesterol‘. 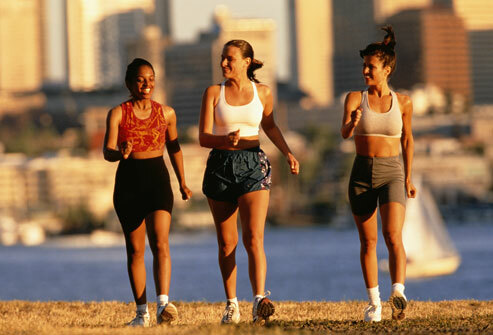 So ladies, get out those track suits and running shoes and let’s get walking to longer and healthier lives!!! P.S: Contact us at wholewomannetworkinc@gmail.com for our group walking locations/schedules or to start a walking club in your community. Visit WWN’s Website for links to other walking clubs in the community. Sources: Harvard Teaching Hospital Beth Israel Medical Centre; Readers Digest; Canadian Medical Association journal…..
Pingback: 1000 Women | Ladies, Top 10 Reasons why Walking is Good for You! !